Timing is everything when it comes to releasing movies at the box office, which made watching the screening of The Nutcracker and the Four Realms an odd experience. One one hand, Thanksgiving hadn’t even arrived, yet. On the other hand, I was watching this Christmas-based film on the day before Halloween. Talk about jumping the gun a bit. Scoring big box-office bucks is especially important for a film’s first weekend as a nationwide release. Momentum can carry a holiday-themed movie which rolls out during the first week of November all the way into the new year. Beating other films to movie theaters is very important and many studios cut corners on quality (and storylines) in order to get the initial attention of moviegoers. Sadly, this is the current state of the industry, where release dates matter more than the actual movies, themselves. 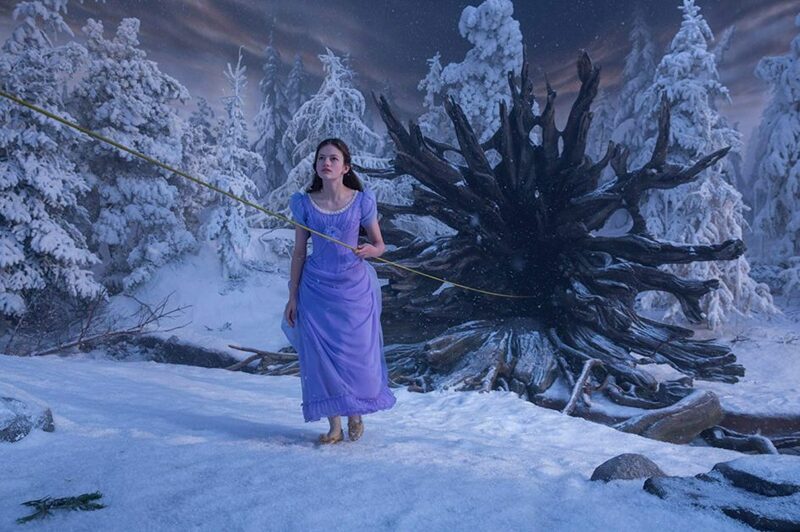 All of this leads us to an all-new adventure based on the story of The Nutcracker. Disney’s no slouch when it develops big-picture concepts, but Four Realms‘ overall storyline really isn’t a traditional holiday movie. In fact, other than the story’s events taking place on Christmas Eve and Christmas Day, there really aren’t any other holiday references made throughout. And there’s barely any sort of musical cues from the famous ballet, which this film is based. It almost feels like the movie studio really tried hard to create a holiday movie without trying to upset any religion. Instead, it just feels like… a plain, almost boring, movie. There’s some familiar faces making appearances (Morgan Freeman, Helen Mirren, Keira Knightley) and the cinematography is outstanding. There’s a Nutcracker… and a Sugar Plum Fairy. And in certain scenes, there’s snow and a frozen lake. But other than that, there really isn’t anything else to make you think this is an all-new holiday classic. As a HUGE fan of holiday films, I was very interested in Disney’s concept of attempting to create a new expanded universe for this holiday, er, movie. I mean, it’s right there in the title: Now with Four Realms! Surely there would be four new worlds and tons of new characters to learn about. Instead, it’s mostly a tale of an estranged daughter, who learns about her recently deceased mother via newly introduced people. All these new characters basically tell the story of a person who isn’t onscreen. Let’s just say the storyline goes into so many directions, the studio had to (eventually) hire two directors: One for the initial filming and another for the reshoots, trying to cobble some cohesion together. I was expecting something so much more from Oscar-nominated Director Lasse Hallstrom (The Cider House Rules) and Joe Johnson. If you had told me the same director who brought Captain America: The First Avenger, October Sky, The Rocketeer and Jurassic Park III to the big screen was to work on a Disney family film, I’d be all in. Instead, this is what we got. Timing is everything. It could still fare well with filmgoers, but to release this movie the same weekend as a WWII Zombie film (Overlord) and a Queen biopic (Bohemian Rhapsody) creates a full marketplace with a variety of topics. There might not be enough interest for Disney to make back its initial investment… unless they were planning on creating an amusement ride off the film at Disney World all along.